MCKINNEY, Texas – August 28, 2018 – Sigmetrix announced today that it will feature its latest tolerance analysis and GD&T / GPS software solutions as a sponsor and exhibitor at the International CAE Conference in Vicenza, Italy on October 8th-9th, 2018. Visitors to the show are invited to experience how Sigmetrix’ offerings complement and enhance simulation-based engineering. The Best Poster Award which testifies to the visionary understanding of the new generation of engineers and scientists spanning new fields and also supports the discussion around how education should help this evolution. 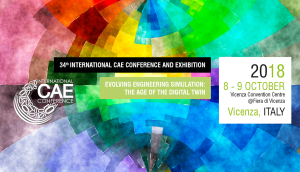 All in all, the International CAE Conference and Exhibition 2018 will offer the most intense and concentrated forum for all the stakeholders who can benefit from the Engineering Simulation world. 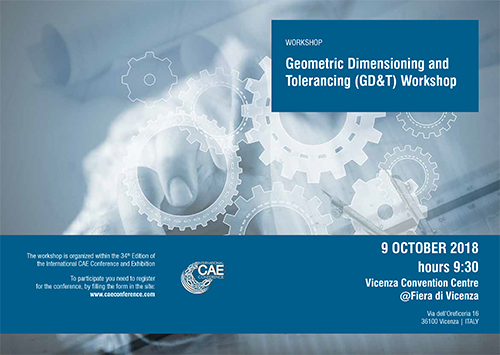 Sigmetrix President James Stoddard will be participating in the “Geometric Dimensioning and Tolerancing (GD&T) Workshop” on 9 October 2018. This workshop will demonstrate how companies can leverage state-of-the-art GD&T methods and instruments to create more robust hi-tech products while containing production costs. For more information on the International CAE Conference 2018 visit: http://www.caeconference.com/. EnginSoft is a premier consulting firm in the field of Simulation Based Engineering Science (SBES) with a global presence established in 1984. Throughout its long history it has been at the forefront of technological innovation and remains a catalyst for change in the way SBES and CAE technologies are applied to solve even the most complex industrial problems with a high degree of reliability. Today, EnginSoft is comprised of groups of highly qualified engineers, with expertise in a variety of engineering simulation technologies including FEM Analysis and CFD, working in synergic companies across the globe. EnginSoft is present in Italy, France, Germany, the UK, Sweden, Turkey and the U.S.A. and have a close partnership with synergetic companies located in Greece, Israel, Portugal, Brazil, Japan and the U.S.A. We work across a broad range of industries that include the automotive, aerospace, defense, energy, civil engineering, consumer goods and biomechanics industries to help them get the most out of existing engineering simulation technologies.